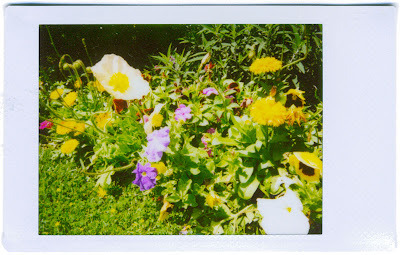 I just received my Cheki Instax Mini camera and this is the first photo, roughly the size of a standard business card. It is most likely going to be my new obsession and drive me into debt considering the film price per image works out to be about $1.70. I guess I better make them count. This image is the flower bed in front of my apartment; the one to the upper left looks like a fried egg. Dizz-ang, that film is ridiculous! But I'm jealous of your fried egg plant.